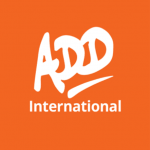 ADD International is a disability rights organisation. We fight for independence, equality and opportunity for disabled people living in poverty in Africa and Asia, by supporting disability activists to bring social change. Working as an ally of the global disability movement, we tackle discrimination to ensure every disabled person gets a fighting chance at living their best life. One billion people worldwide are disabled. 80% of them live in the developing world. Disabled people living in poverty are among the most vulnerable and marginalised people on earth. Often, they have no access to basic human rights, education, or the opportunity to earn a living. We support local disability activists and their organisations by providing the tools, skills and resources that can enable them to become functioning organisations and powerful movements for change. We strengthen the disability movement in Africa and Asia by supporting local groups of disability activists to build strong and sustainable organisations that can have an ever-increasing impact. We then help these groups connect with each other to build wider movements; we then work with them to promote the rights of disabled people. Lastly, we work with disability activists and their organisations to influence governments, international development organisations and the private sector to design policies and services on a local and global scale which take into account disabled people and offer inclusive solutions. A gift in your Will support future generations of disability activists.